In conjunction with the theatre season, artist and curator Hamja Ahsan has curated a special exhibition built around his archive of theatre posters, performance art and other related material. Participants include include Prachayanat - a theatre collective based in Dhaka consisting of over 100 people, early graphics from artists and musician Harold Rasheed, DRIK based photographers, and contemporary artists-run space Porapara performance art workshops. The designs also reinterpret the Western theatrical canon such as Ionesco's Rhinoceros and Moliere's Tartuffe in a Bangladeshi context. The exhibitions also features photographs from Wasfia Nazreen - a Bangladeshi mountaineer who recently conquered Kilimanjaro as part of Seven Summits. 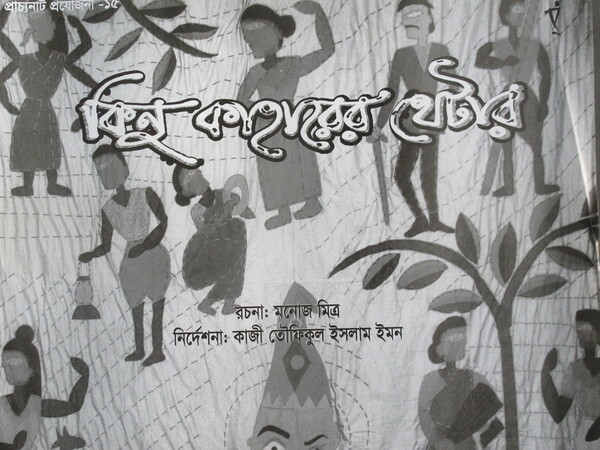 Shlok - Bengali poetry magazine from Dhaka printed entirely on a T-shirt is also exhibition. 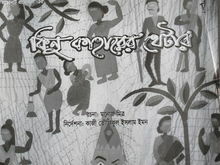 Ahsan explore other patterns of Bangladeshi migration such as the migrant artists network based in Seoul, Korea led by film director Mahbub Alam. A number of emergent artists have also been selected to engage with issues around contemporary culture wars in Bangladesh. This exhibition is part of a wider project called Bangladesh curatorial conversations - critically engaging with questions around nationalism and performance, and working with different disciplines.